METRO is the acronym for MEteors TRajectories and Origins. It is a BRAIN-be networking project funded by the Belgian Scientific Policy. It is an inter-disciplinary project with a collaboration between the Belgian Institute for Space Aeronomy (BISA), the Von Karman Institute (VKI) and the Institut de Mécanique Céleste et de Calculs des Ephémérides (IMCCE). The duration of the project is of 4 years. Meteoroids are small planetary bodies (from 1 m across down to micron-size grains) orbiting the sun with fast speeds , which makes them hard to detect in situ with space-borne instruments or with remote sensing techniques. The most convenient detector at hand is Earth itself as our planet is continuously bombarded by meteoroids that burn up in the atmosphere, creating the meteor phenomenon (or shooting stars). From the properties of these meteors, one can glean information about the progenitor meteoroids. The present project focuses (mostly) on radio meteor observations and what can be learned from them. For that purpose, the unique data set from the BRAMS radio meteor network will be used. BRAMS (Belgian RAdio Meteor Stations, a project carried out by BISA) relies on forward scattering of radio waves emitted by a beacon in Dourbes off meteor ionization trails and received at approximately 30 stations across the country. It monitors the whole sky above Belgium and turns it into a giant detector for the meteoroid population in the Solar System. The receiving antenna located in Uccle is shown in Figure 1. It is worth noting that BRAMS is a very active Pro-Am collaboration since most BRAMS stations are hosted by astronomical public observatories or radio amateurs. 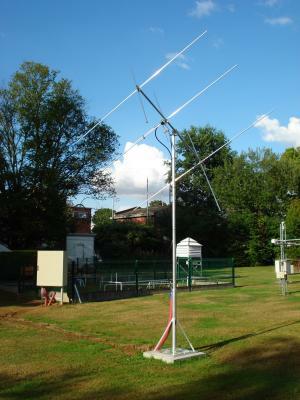 Figure 1: crossed Yagi antenna used by the BRAMS station located in Uccle. Each BRAMS station typically records between 1500 and 2000 meteor echoes per day. 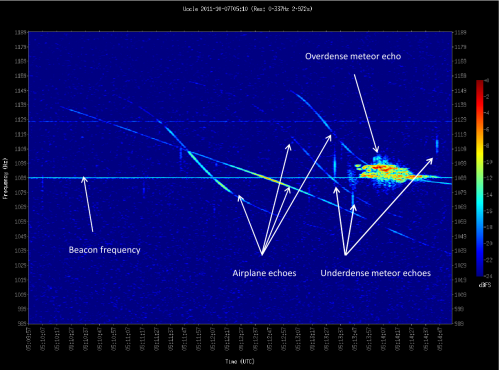 An example of BRAMS observations is provided in Figure 2, showing various types of reflections (various meteor echoes, reflections on airplanes) or direct signals (beacon). One of the main objectives of the project is to determine the trajectories of meteors in the sky above Belgium from data continuously acquired by the BRAMS network. Computing such trajectories in an automatic way for the large number of meteors recorded by BRAMS is a first challenge that has to be addressed. For a number of meteors it is also possible to obtain meteor speed. Combining speed and meteor trajectory, one can trace back the orbit of the meteoroid. A more detailed analysis of radio meteor echoes additionally produces a measure of the degree of ionization created by the object. The VKI team will perform detailed simulations of the hypersonic entry of meteors with various masses, speeds, incidence angles, and compositions, so as to determine the ionization in the meteor trail. As a result, we will be able to translate the radio signatures into a mass estimate, assuming some meteoroid composition (obtained from the literature, e.g. from meteorite analysis), or occasionally obtained from complementary spectroscopic meteor observations to measure composition, at least of bright meteors. Figure 2 : A typical BRAMS spectrogram showing various types of reflections off meteors and airplanes. There are close interactions between the BRAMS team and meteor optical observation networks such as CAMS and FRIPON, which are also active above Belgium. Validation of the results that are obtained with radio techniques will be possible by comparing with those obtained from optical data. It should be noted that radio meteor observations also cover objects that are too small to produce visual emission, while the optically bright objects give very complicated radio signatures that are hard to interpret (see an example with the overdense meteor echo shown in Figure 2). Optical and radio observations are therefore complementary. These results will eventually be used to trace a large number of meteoroid orbits in the Solar System and clarify their association with asteroids, comets, or the zodiacal cloud. Fine structure in the orbital distribution of meteor streams may hint at comet outburst history. This work will be carried out in collaboration with scientists from IMCCE who are specialists in that field. We will not only obtain an orbit distribution, but will be able to produce mass and size spectrum estimates for these objects. Another result of the work will be a meteor impact risk estimate in the ecliptic plane at 1 AU. This is of particular practical relevance for characterizing the space environment to which spacecraft are exposed. Meteoroids have played and still play an important role in the evolution of the Solar System. An additional result from the VKI simulations is the height-dependent elemental meteoritic mass deposition rate. This influx is readily determined for Earth, where it is believed to be a major source of metals in the mesosphere, affecting the local chemistry and likely responsible for polar mesospheric clouds. Metallic grains may also act as a chemical catalyst and therefore even affect climate. The influx is believed to create sporadic E-layers in the ionosphere. Making certain assumptions, meteor entry simulations can be performed for Venus’ and Mars’ atmosphere as well. The results of our study can thus be exploited in Earth observation and planetology studies.